Week 17 brought us the Buffalo Bills making the playoffs for the first time since 1999, along with some huge performances from players around the league. After covering the defensive standouts, here are the Sunday Standouts on offense from Week 17. The San Francisco 49ers ended the year with another win, and once again left tackle Joe Staley had a big game. From 33 pass-blocking snaps, he didn’t allow a single sack, hit or hurry, resulting in a 100.0 pass blocking efficiency rating. Like Staley, Dallas Cowboys guard Zack Martin had a great game in the trenches. Like Staley, he didn’t allow a single sack, hit or hurry from 33 pass-blocking snaps, giving him a pass blocking efficiency rating of 100.0, and produced a 93.7 PFF run-blocking grade. The Kansas City Chiefs didn’t need to win on the final Sunday of the NFL season, but wide receiver Albert Wilson delivered an impressive performance all the same. Playing 20 snaps as a receiver, Wilson racked up a ridiculous 7.35 yards per route run, linking up well with rookie quarterback Patrick Mahomes. Minnesota Vikings second-year tight end David Morgan had a solid game as a receiver, catching all three passes thrown his way for 35 yards, but it was his work as a run blocker that really impressed. Producing an 85.5 PFF run-blocking grade, Morgan was the best tight end in the NFL in that regard in Week 17. It’s impossible to have a more efficient day as a receiver than Seattle Seahawks wide receiver Doug Baldwin had on Sunday, with Russell Wilson producing a 158.3 NFL passer rating on throws to him. Targeted five times, Baldwin picked up four receptions for 90 yards, with two of those catches resulting in touchdowns. In the 49ers final game of the season, they saw a big performance from guard Laken Tomlinson, who impressed both as a pass and run-blocker. Producing a PFF run-blocking grade of 86.5, he also didn’t allow a single sack, hit or hurry from 33 pass-blocking snaps, good for a pass-blocking efficiency rating of 100.0. 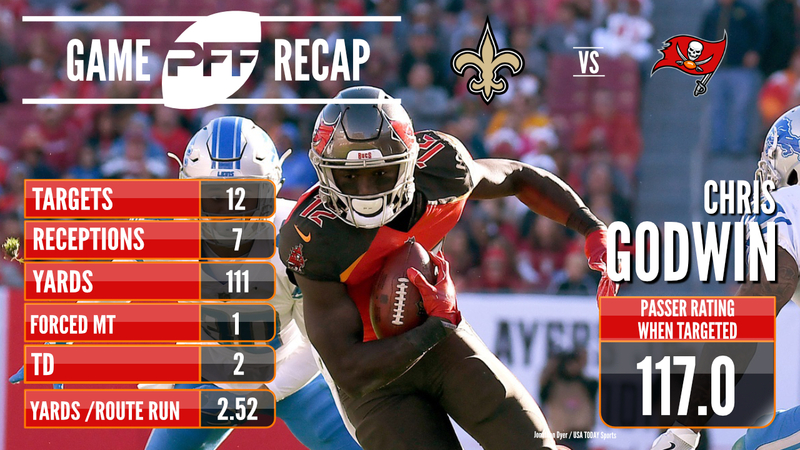 Ending his rookie season on a high, wide receiver Chris Godwin had a big game for the Tampa Bay Buccaneers. With 44 snaps in route, he picked up 111 yards on 12 targets, giving him a 2.52 yards per route run average that ranked 14th among wide receivers yesterday. In the end, the Los Angeles Chargers couldn’t recover from a poor start to the year and make the playoffs, but quarterback Philip Rivers finished their first season in Los Angeles with an impressive performance. With three drops and a throwaway contributing to four of his nine incompletions, Rivers finished the game with an 86.1 adjusted completion percentage that ranked first among quarterbacks this week. 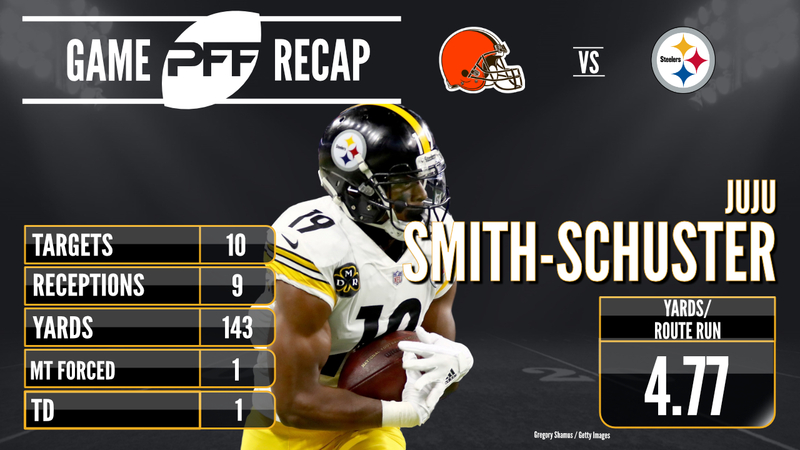 Not even taking into account his kickoff return for a touchdown, Pittsburgh Steelers rookie wide receiver JuJu Smith-Schuster finished his rookie campaign with a big performance in the win over the Cleveland Browns. Racking up 143 yards on 30 snaps in route, his 4.77 yards per route run average was the second-best of any wide receiver yesterday. The Carolina Panthers didn’t manage to win the NFC South, but guard Andrew Norwell delivered a fantastic performance in pass protection as they head into the playoffs. Playing 39 snaps as a pass-blocker, he didn’t allow a single sack, hit or hurry, finishing the game with a pass-blocking efficiency rating of 100.0.